Although his appearance belies his age Chandu Borde will turn 85 this year, which no doubt explains why he is a wise man. That much is clear from his very first words in the introduction to Panther’s Paces, his autobiography; the purpose of writing an autobiography is two-fold. The first is to document one’s life and the second is to set the record straight. The second, quite often, becomes an excuse for washing one’s dirty linen in public. Books by sportsmen are no different, and those that involve linen laundering can be entertaining. Anyone hoping for that here however will be disappointed by Borde’s next sentence; while I am comfortable with the first, I have always been uneasy about the second. Borde made his debut for India against West Indies at the Brabourne Stadium in November 1958. His last, and 57th Test, was at the same venue eleven years later, against Australia. He contributed little to either game, and had little to show for his two visits to England, one to West Indies and one to Australia, but despite that his record is a creditable one. He has an overall batting average in Tests of 35.59, and in the early years was a useful leg spinner. He had a fine all-round series against England in 1961/62 when, to the delight of the whole country, India won a series against England for the first time in thirty years. As there is no dirty laundry in Panther’s Paces there is a lot of cricket. The detail is not overdone, but Borde looks at all the Tests in which he played. He also dwells on some domestic cricket and when, in later life, he was involved in the administration of the game some more recent matches. Unsurprisingly a 73 year old Borde much enjoyed his stint as manager of the side that visited England in 2007 and took the three match Test series 1-0. His seven Tests in England as a player had all ended in defeat. A book like Panther’s Paces could have been a rather dull one, had it been written by someone like Garry Sobers or Fred Trueman. That pair, and many of their contemporaries, played in plenty of series that were copiously chronicled at the time, and feature in numerous books. There is the odd book that touches and concerns the series in which Borde played, but not many, and it is interesting to read about matches that seldom make the history books. By way of example there is no book on that 61/62 England series, or indeed that of two years later when all five Tests were drawn. There is no book devoted to the series that followed in the Caribbean, although a number of books deal with the horrific injury that Nari Contractor suffered when struck by a bumper from Charlie Griffith. There are no revelations about that appalling incident in Panther’s Paces, but Borde’s is an interesting account of a troubling incident nonetheless. Being an autobiography Borde gives his views on the finest players of his time. There are no surprises there although there is a reminder to this reviewer that whatever benefits there are to being a young cricket fan in the twenty first century there is surely nothing that can make up for not having been able to watch Sobers play. I am sure Borde would agree, and the ‘Lion of Cricket’ himself contributes a foreword to the book, and one in which I strongly suspect the great man wrote every single word himself. And what of the three issues we always (well almost always) raise with biographies and autobiographies; statistics, photographs and an index? In fact there is no index, but I am inclined to draw a veil over that one for once as at no point did the absence of one frustrate me. The statistics are unusually presented, but extend to forty pages and, once the format becomes familiar, are an engrossing read in themselves. As for the photographs there is an excellent selection. 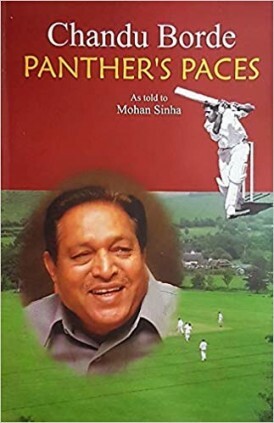 All in all Panther’s Paces is a fine autobiography, and one that adds much to the library of anyone interested in the history of Indian cricket. A 'Pom' justifying Bodyline? I will have to read this one! The only thing that is stopping me from banning it from the site, is that I hold the opinion of Martin in high esteem.